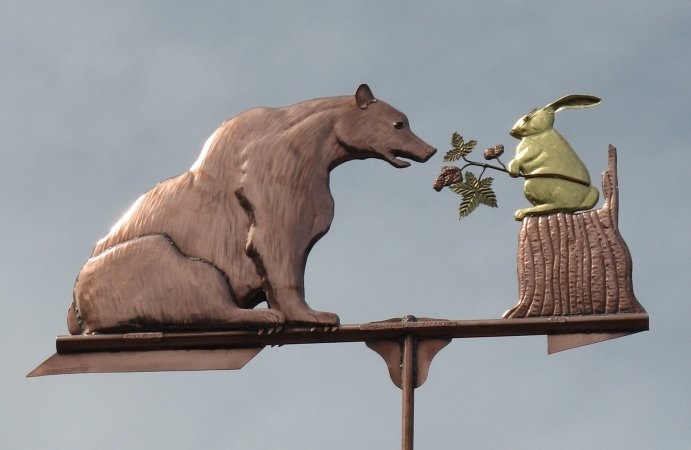 This Bear with Bunny Weathervane was created in copper with brass berry leaves and optional gold leafed bunny. 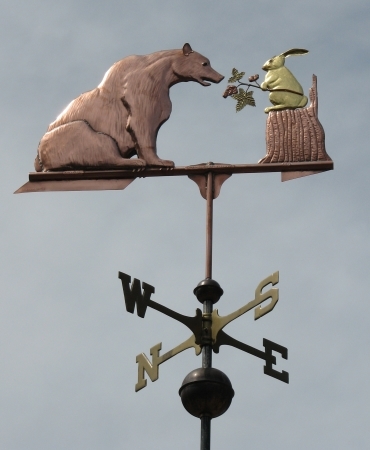 This whimsical weathervane design was commissioned by a couple whose nicknames were ‘Bear’ and ‘Bunny’. They wanted a realistic looking weathervane that was compatible with their personas and had a friendly feel to it. The berries symbolically represent the fact that two very dissimilar creatures can share a common love. It was a bit of a challenge to come up with a design that fit their requirements, but all of us were pleased with the result. 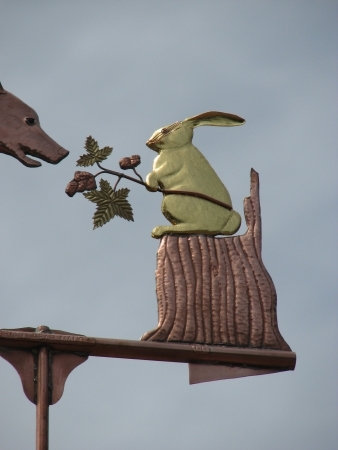 In this weathervane, our artists used custom made hammers to achieve all of the different textures you see here; the shaggy coat of the bear, the smooth silky rabbit’s fur, the rough, craggy bark on the tree stump, the veins in the berry leaves.and the plump smooth berries. The bear’s fur coat alone required close to 800 individually positioned hammer blows! Both the bunny and the bear have brown glass eyes with black pupils to give them a more lifelike and animated appearance. 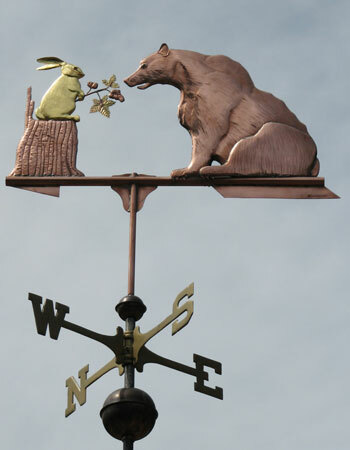 Because our weathervanes are made to order, we could separate out either the bunny or the bear, for example, and make a weathervane based on one design element or another. We have done this on numerous occasions where one part of a weathervane design catches someone’s fancy and we use it as the starting point to come up with a new design with an entirely different focus. This is not a weathervane ever likely to be mass produced due to its unusual subject matter. We see our role in the weathervane making continuum as creating sculpture pieces with special meaning to each customer. Most people will only buy one weathervane in their lifetime, if they buy one at all, and our goal is to make them something they will want to keep and hand down from generation to generation as a special family heirloom. Rather than striving for a mass production market, we seek to create weathervanes that are personal and have meaning for the individual.